Of the many film versions of a Christmas Carol, the version starring Alastair Sim is easily the best. (Watch the whole film here)* His mixture of humor and pathos, along with classical acting chops, makes his the best Scrooge of all the film versions. When I read A Christmas Carol, I see Alastair Sim. When I see Alastair Sim in other movies, I think “what is Ebeneezer Scrooge doing in this film?” His is the definitive version, the standard against which all others are measured, and all others are found lacking. I just saw the 1938 version with Reginald Owen. It was good, but he was not as natural playing Scrooge as Sim was. There was too much ‘acting’ going on for me to get lost in the movie. I have the same complaint with the version that starred Patrick Stewart a few years ago. I like Patrick Stewart, but his portrayal of Scrooge is just a showcase for his acting skills, almost as if he figures there is no way he will ever be allowed to play King Lear on American television, so he might as well stretch out with the role of Scrooge. How long before Kenneth Branagh does a version? Ewan MacGregor is too young and too Scottish, and Hugh Grant is too much of whoopsie to pull it off, but Branagh could do it, and do it well. Gary Oldman would just scare the kiddies shitless, so he is out as Scrooge, although he could play Marley’s Ghost in the Branagh version. Add Alan Rickman as the Ghost of Christmas Past, Brian Blessed as the Ghost of Christmas Present, Hugo Weaving as the Ghost of Christmas Future (He did just fine hiding his face in V for Vendetta, so he could do this Ghost) Alan Cummings as Bob Cratchit, with as special appearance by Stephen Hawking as Tiny Tim, and we have ourselves one hell of a film. This needs to happen. 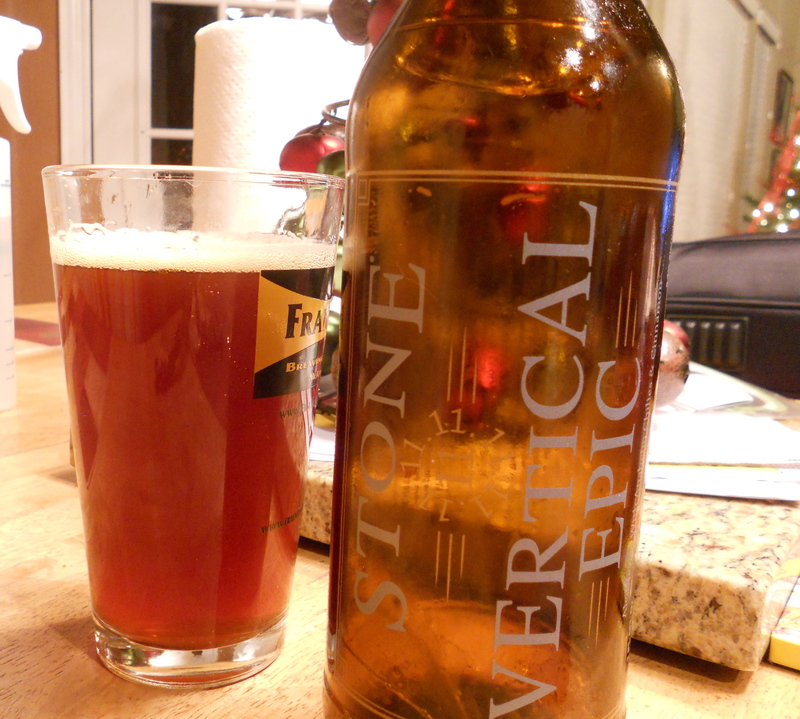 For the Eleventh Day of Christmas, I cracked open a bottle of Stone Brewing’s 11.11.11 Vertical Epic. * This ale is brewed with Belgian Yeast, which gives it a funky aroma and some banana flavors. Cinnamon and New Mexico Green Chilies were added to the boil, with the heat from the cinnamon noticeable on the front end, and the mildest heat from chiles in the aftertaste. The cinnamon and the chilies complement each other, and neither overpowers this beer, as is often the case with chili pepper or cinnamon infused beers. There are plenty of hops here as well, adding layers of flavor. This is another wonderful beer from Stone, 8/10. *Do you see what I did there? Eleventh Day of Christmas paired with 11.11.11? I am on a roll! The Tenth Day of Christmas: A Tilting Suds Christmas Playlist, Vol. 2. 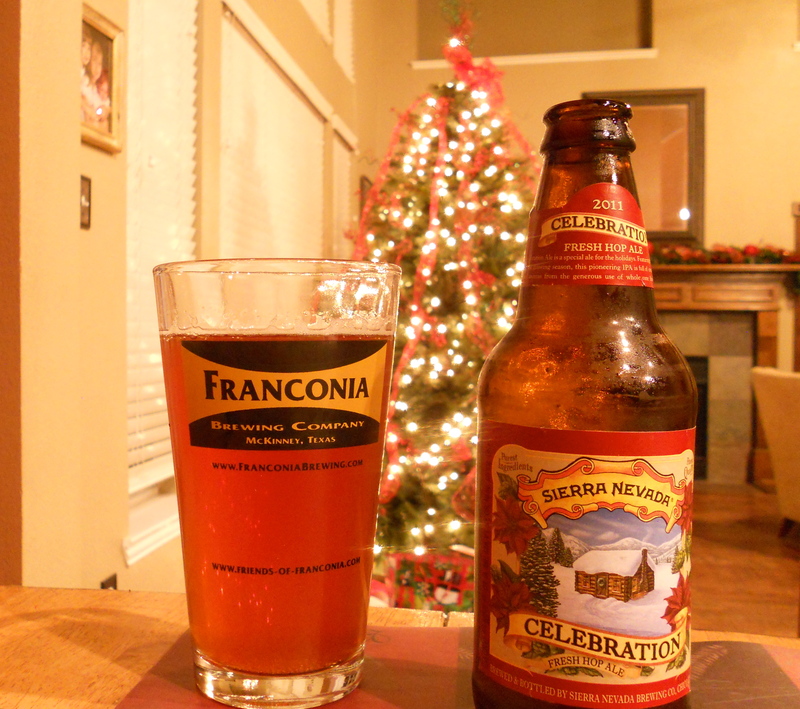 Clearly not a Christmas beer, just based on the Day of the Dead label design, but I am including it here because I have only recently tried it, and if you look closely at the photo, there is a small Christmas tree visible in the background. 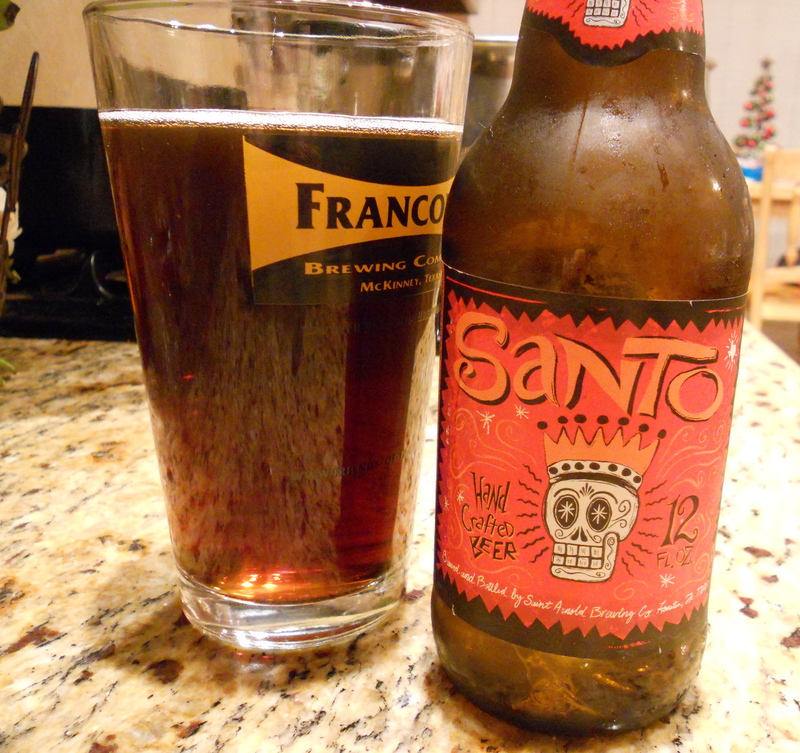 The Santo is Saint Arnold’s version of a German Kolsch, and hews quite close to that traditional style. Saint Arnold says it is darker than a traditional kolsch and I suppose that is true, but the profile (malty, light bodied, mild floral hops) is 100% Kolsch. While I liked it, I am not a huge fan of German style beers, but if you are, you will probably enjoy it more than I did, 6.5/10. I have never had a brown ale that I loved. I have never had a brown ale that I hated. Brown ales are the mediocre middle children of the craft beer world. Damn near every brewer makes one, and whenever I have one, I am always slightly disappointed. Not because whatever brown ale I am drinking is bad, but because I could have had something better. 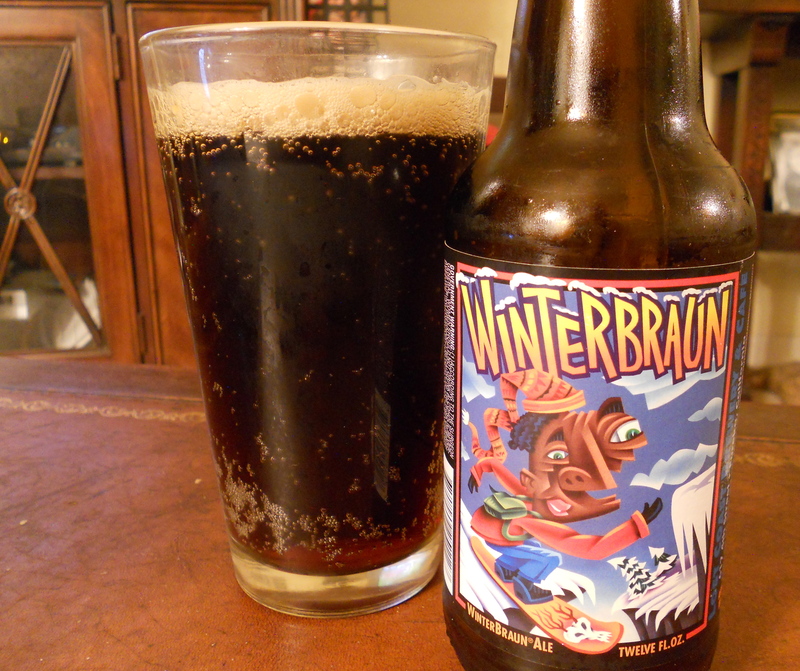 Winterbraun by Lost Coast Brewing is a chocolatey smooth brown ale, with some notes of coffee and dark fruit. It pours a rich, velvety blackish brown with ruby highlights, and a cappuccino colored head. 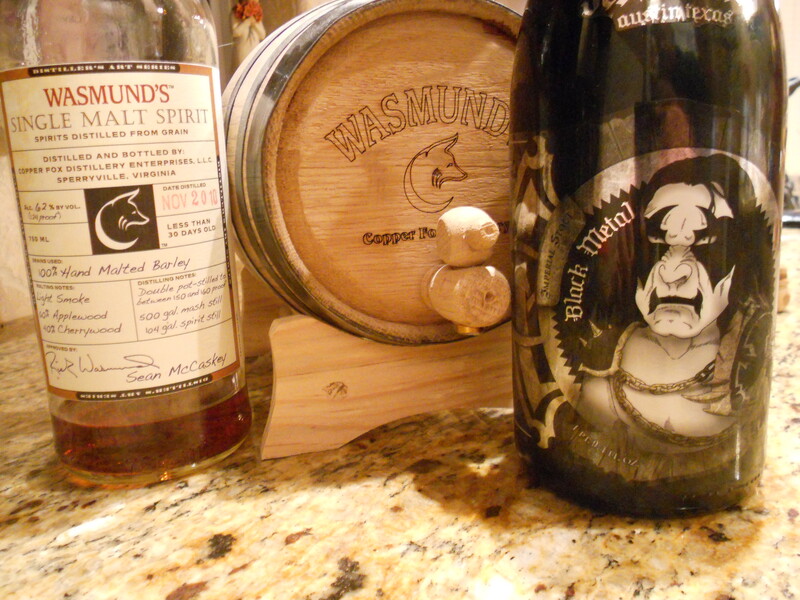 It has a nutty aftertaste and and there is the mildest of nutmeg flavors here. Do I love this brown ale? No I do not, but I do like it more than most brown ales, and would gladly drink this again, 7/10. You are currently browsing the archives for the The Twelve Days of Christmas category.